Earlier this month I collaborated with the Indonesian Embassy and the Smithsonian Institute to organize a four-day festival of Indonesian performing arts in Washington, DC. Hundreds of performers of gamelan, traditional Indonesian percussion orchestras made up of bronze gongs, chimes, metallophones and drums performed in ensembles ranging from 4-40 musicians, descended on the Smithsonian’s Freer and Sackler galleries. In addition to professional ensembles flown in from Java, Bali and Sumatra, American ensembles came from as far away as California and up-state New York. The festival included groups performing both traditional and contemporary repertoire as well as experimental ensembles whose link to Indonesian arts is only by way of inspiration. Performances of American Broadway tunes, arranged for gamelan by migrant Javanese living in Northern Virginia would be followed by, for instance, experimental compositions for robotic gamelan created by installation artists from Brooklyn. While esoteric, gamelan is now a firmly established aspect of American culture. Today thousands of Americans are deeply engaged in the performance of Indonesian traditional music in roughly 170 gamelan ensembles found in 41 states. Gamelan, found principally on the islands of Bali and Java, developed at around the same time as the European symphonic orchestra. Following the 16th century both societies, representing the geographic extremes of Indo-European culture, expanded their musical ensembles to unprecedented scales, added and invented new instruments, extended their tuning systems, and began to create instrumental works that stood on their own as detachable, coherent works of art independent of ceremonial contexts. Both musics emerged with global modernity and new regimes of art. Both are iconic of the massive psychic, social, technological, and economic transformations of a post-Enlightenment world. Gamelan was first performed in America in Chicago at the East Indies pavilion in the World’s Columbian Exposition in 1893. The music would not be performed again in America until the mid-1950s when the scholar Mantle Hood brought gamelan ensembles and teachers to UCLA’s Institute for Ethnomusicology. During the subsequent two decades gamelan ensembles flourished at colleges and universities across the nation. This was partly a result of governmental research investment in Southeast Asian studies. The production of new knowledge about the region was encouraged by intense cold-war era competition for military and political control in Asia generally. Intense American investment in academic, military and aesthetic interactions between the two nations played out in the violent replacement of Sukarno’s left-leaning “Old Order” (1947-1965) by Suharto’s stridently pro-Western “New Order” (1966-1998). The decades of the New Order were the salad days of American gamelan, and ensembles were founded on many liberal arts campuses. The large ensembles fit well into the structure of American academia; the formulaic structuring of parts, most with a gentle learning curve, allowed departments to move up to 30 students at a time through introductory courses and to present end-of-semester concerts on spectacular sets of exotic instruments which became an elite status marker for many American campuses. 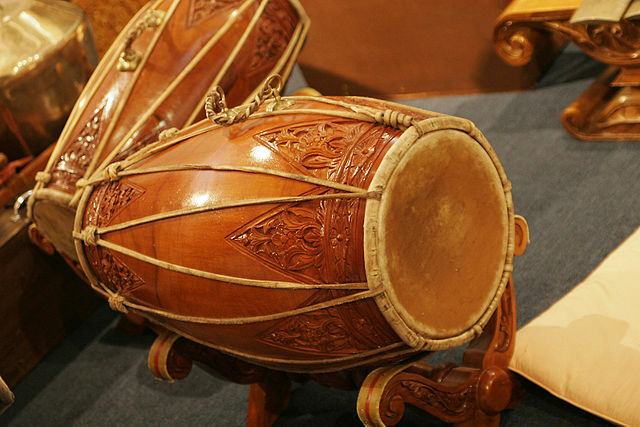 Traditional Indonesian drums at the Indonesian Embassy in Australia. Photo by Fir0002/Flagstaffotos. CC BY-NC via Wikimedia Commons. But while such a top-down historical account helps to explain how Americans came to encounter gamelan in the first place, it does little to tell us why it means so much to so many contemporary American performers—why it is felt as a musical home, even if it is borrowed. Indeed, many of the American performers that participated in the recent festival at the Smithsonian dug deep to cover their air travel or loaded up their instruments and musicians in caravans of cars, heading to the nation’s capital for a kind of percussive Woodstock. In America gamelan may function as an apparatus of aesthetic transgression. Generations of American composers have been drawn to gamelan partly because its unique tuning is radically divergent from Western models. The spread of Western tuning systems via global capitalism has overwritten vernacular intonations, and many American composers have heard in gamelan tunings a form of symbolic resistance against the rationalizing logics of imperial modernity. To ears trained in the Western tradition gamelan can represent a pseudo-disorder, a potentially subversive noise that allegorically betokens difference and marginality, representing a statement against repressive control. To many of its American performers, gamelan appears organized by principles of non-hierarchical interaction and complex interlocking requiring close interpersonal cooperation and listening. For some Western performers it has become an incarnation of an idealized humanity, a harmonious, non-conflictual form valuing group over individual. Gamelan may represent performers’ principal contexts for face-to-face sociality in an era in which nearly total social atomization is made possible by both the anonymizing welfare state and the digital workplace. It may become a site in which both middle-class white-ness and, to a lesser extent, Asian-American-ness are worked out. Many Anglo participants come to gamelan seeking, as one musician once put it to me, “culture, where we had none.” For those without access to the performance of “ethnic whiteness” (e.g. bluegrass), gamelan becomes an alternative form of cultural expression, albeit one marked by anxieties of inauthenticity and appropriation. In America gamelan appear not only in showcases of exotic authenticity but in hybrid spectacles that recall America’s interwar politics of representation: white neo-burlesque dancers performing Balinese moves at raves, DJs manipulating robotic gamelan at Burning Man, etc. By presenting images of “tradition” free of the signs of modernity and hybridization, “authentic” performances freeze the other in a past that appears to deny potential transformation. Contemporary spectacles of hybridity suggest that it may be the assumption of authenticity that is the truly distorting exotification. In this context performers seek the freedom to unselfconsciously enjoy and transform as “ours” what was once felt to be exclusively “theirs.” In 2007 the renowned Indonesian composer I Wayan Sadra argued that, like Western modernist music, gamelan had achieved the status of a “global culture” owned by no one in particular and open to transformation by anyone. Andrew Clay McGraw is Assistant professor of music at the University of Richmond and author of Radical Traditions: Reimagining Culture in Balinese Contemporary Music. His writings combine ethnographic, music-theoretical, semiotic and critical analyses to consider the fields of traditional and contemporary music in Southeast Asia. As a composer and performer he has collaborated with Bali's leading composers and ensembles. He has founded and directed several gamelan ensembles in the United States. A video of Andrew McGraw of the group Gamelan Dharma Swara offering a brief introduction to Balinese music can be found on the Asia Society website.